Built on a 13 Century baronial estate of Meldrum House the 6.375 yard par 70 course was designed by local born Graeme Webster. 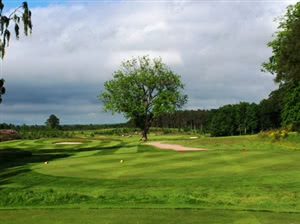 Reputed to be one of the finest golfing experiences in Scotland the course has been laid out through picturesque woodland and incorporates spectacular water features. It has been built to exacting specifications and the greens are some of the best in the country. The natural terrain made an ideal canvas for a course and the large and heavily contoured greens offer a variety of challenging pin positions. A profusion of wildlife abounds with swans, ducks and trout inhabiting the ponds and red squirrel, roe deer and fox roaming the course. With Meldrum House offering the option of 'stay & play' visitors are always welcome.